With 6 Stars now the minimum level of energy efficiency for new homes & significant renovations, high performance windows are more important than ever. 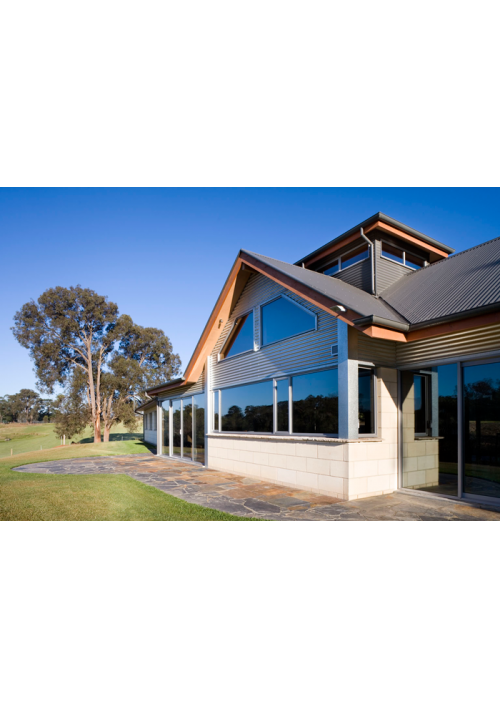 To help simplify decisions & comply with the Building Code of Australia, Rylock suggests using 6 star windows within 6 star homes. Rylock’s industry leading Thermally Improved Suite in its ‘basic’ form (4mm clear glass and a 12mm air-space) earns a 6 star rating in Melbourne’s heating climate. For even greater results, you can select high performance glass. This table shows winter heat/loss, and outlines options available to improve heat retention within your home. WERS is an abbreviation of ‘Window Energy Rating Scheme’, and is a program specific to Australia. 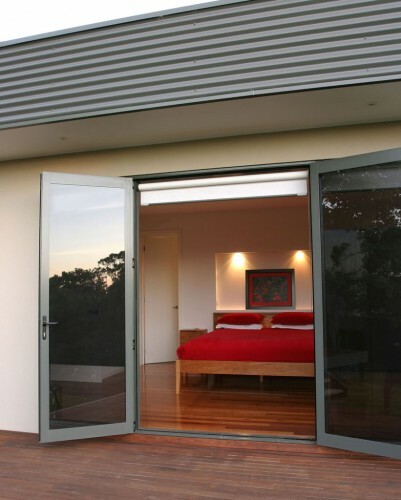 Introduced in 1995, WERS is managed by the Australian Window Association. Rylock has participated in WERS since its inception. The following extract from the WERS website gives a brief outline of the intended role of the program. The main purpose of energy efficiency in a residential application is to reduce the amount of times the heating and cooling appliances are turned on & off. 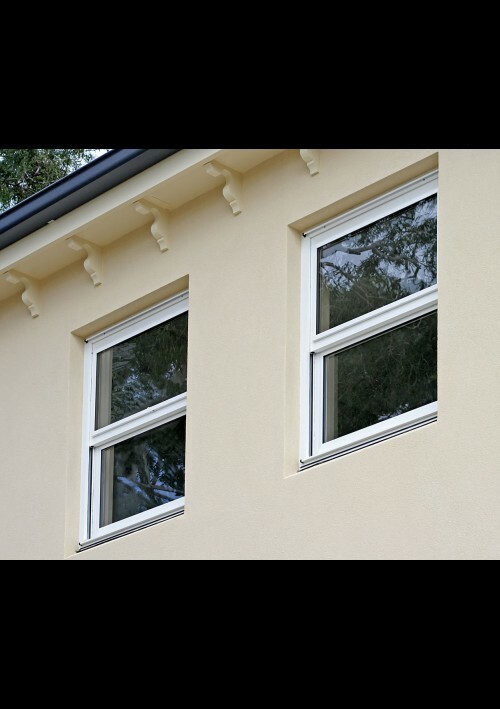 WERS rated residential windows have star ratings & percentage improvements to help give an easy comparison of windows’. The WERS star ratings take into consideration more than just the insulation values of product frames & glazing. 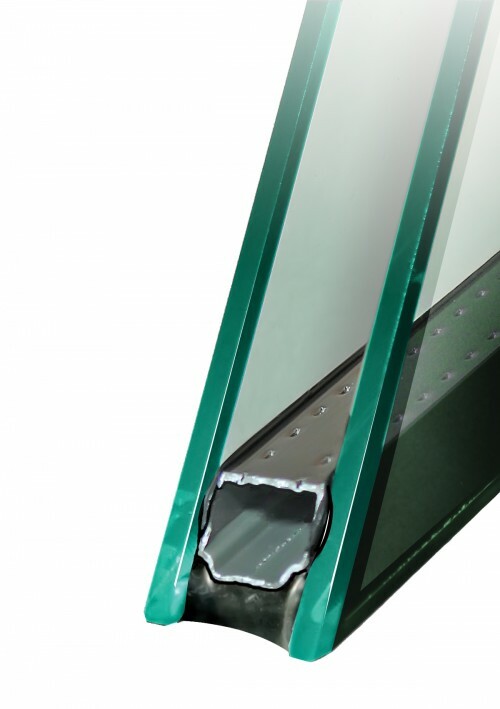 Effective seals on operable doors & windows or between glazing & frames help prevent the undesirable leakage of cold or hot air. Star ratings recognise this within their values. Rylock’s custom WERS ratings are available for download below. 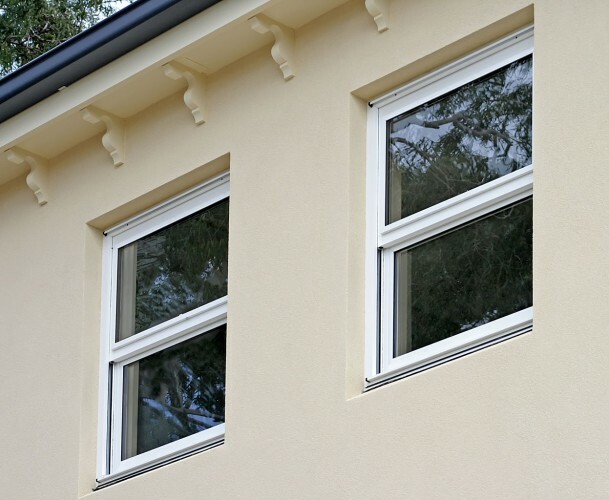 Please note that products with ‘TIA’ in the title refer to Thermally Improved Suite windows & doors. 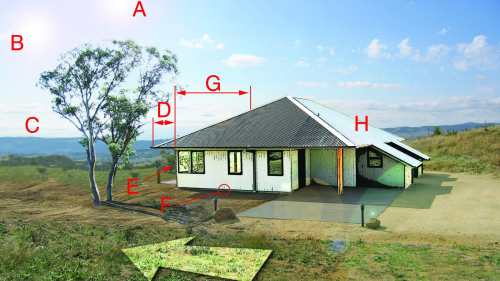 The above residence has been designed for south-eastern Australia – a “heating” climate. In summer, when the sun sits higher in the sky (A) than in winter (B), appropriate eaves (D) shade main living areas from heat. In winter, they permit sunshine to warm the interior. To the west, eaves protect smaller windows (E) from the afternoon summer sun. Deciduous trees (C) block the sun in summer; whilst in winter the lack of foliage allows sunlight to pass. The residence has been oriented with living areas (G) to the north. Dark tiles and polished concrete floors assist the slab (F) to absorb heat for thermal mass. Daytime heat can thus be stored for the night. The sleeping areas (H) to the south have been carpeted. Where low light transmission is an issue, Solar Control Glazings are an effective solution. A popular version is nominally green in appearance; however, it is barely perceptible when viewed from the inside looking out. Solar Control Tints are also referred to as ‘spectrally selective’, which means they are able to reflect those wavelengths particular to the infrared – or heat – portion of visible light. 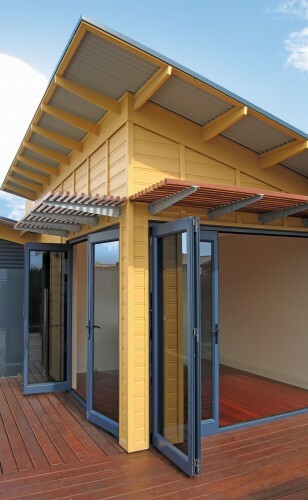 Shading glazed areas from harsh afternoon sun is an efficient way of countering summer heat gain. Also critical is the thoughtful orientation of the building within the land available. However, compromises exist within any building design and sometimes the need exists for a glazing option that can minimise the impact of the harsh afternoon sun. The common downside to body tinting is that visible light transmission is compromised, leading to darker interiors.